Dimensions 18.5 In. X 18.5 In. X 5.8 In. We purchased two of these for our master bath remodel. They shipped quickly (of course, with Overstock--shipping is the fastest on the internet! ), and arrived in perfect condition. However, after they arrived, we realized with our new vanity purchase and custom concrete countertop we were waiting for, these sinks put the height way too high for our bathroom. If you are using an existing vanity (the old kind, which are shorter), then you will LOVE this sink! The Kraus Square White Ceramic Vessel Bathroom Sink was a perfect fit for the small bathroom, just the right size in addition to the right look, sleek, clean and modern. It arrived perfectly wrapped and with an impecable finish. Incredible value ! Received the sinks and they are definitely gorgeous. I cannot wait to have it installed in my guest bath. Could not afford to totally gut my bathrooms so I decided to just update them with new vessel sinks and faucets. I even used existing Wish Overstock had a pic gallery for all these home improvement products being applied to real environments. This way everyone can see it and judge the product for themselves. Love the drain it came with! Love this sink and especially the drain it comes with! Heavy duty and very european looking drain. I haven't installed it yet, but I can't wait. 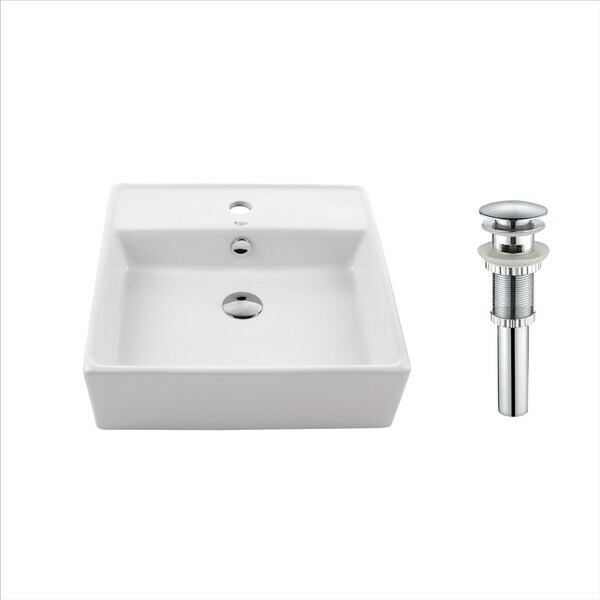 The sink is perfectly square, has a great finish and can be wall mounted. We were looking for modern 48 wide sink for our master bathroom. Since everithing outhere was very expensive we decided to go with two sinks. This Kraus Square White Ceramic sinks are just perfect fit for our renovation. The price, quality and look are great not to mention how quickly we recieve them. Thank you Overstock. these sinks are a great buy. do concider that they are tall sinks and will not work on standard 36 inch cabinet. We bought two of these to update our master bathroom. We simply put these on top of an excising tile counter and bought new faucets. What an impact. The added plus is because they sit on top of the counter, they have raised the sink/faucet up to there newer counter level you see in newer homes. I love the sink, but the plastic overflow cover that is colored chrome to match the drain has started discoloring. I don't think it is from my cleaning products (I use mostly hippy-dippy natural ones). Other than that I really love the sink, installed it myself and it was a snap. The sinks came in about one week. They came perfectly packed with everything included, even the pop up drain. Although they are not installed at this time, they look beautiful! Especially with the faucet I chose. Plus you can save money, because you don't have to buy the tall faucets. I chose this sink because it made sense for the cleanability around the faucet. That is where you would most likely keep your wet soaps and things and all you have to do is swipe it in the sink. On top of that, you still get the WOW factor with this vessel! You can't beat the price! I gave this sink a 4 star rating, just because it is not installed yet. Thanks, Overstock.com. I love my new sinks. Very well made!!! The only downside was that the pop up drain dome in chrome, so I had to buy drain in the finish I needed, so that was an additional $60 bucks for two. Very solid high quality sink. It does have a huge drain cover but give it a cool look. Just more industrial looking than I anticipated. We installed these in both men's and women's restrooms in our offices. They are super sturdy and look extremely high end. Purchased in 2015 and have never had any trouble. GREAT PURCHASE!!! Very well made! Pictures don’t do it justice! I loved the new style drain this has I don’t think I’ll ever go back to the old style lift levers we all grew up with! Great looking square vessel sinks that met our needs. Came with nice pop-up drains as well. I was looking for a sink to sit on a floating shelf and came across this one. I'm very happy I decided to buy it. It's a great size for a powder room. It's substantial yet elegant. It is a true white which I was looking for. I had no problems installing the faucet and drain. Lovely, contemporary sink! We bought 3 and the installation has stalled on the first one... The vessel drain that came with the sink is 1/4" too short of being long enough to connect to the underside of the sink. Frustration begins! I purposely purchased this sink because it had the coordinating drain to avoid this exact problem. "I have bought Kraus vessel Sink Model #150 I would like to buy a faucet compatible in bronze what do you suggest?" "Does this sink require a vessel or regular faucet?" A regular faucet is fine. "the description of this sink says it comes with a faucet in chrome color. Is that true?" Hello, odin8117. This come with a pop-up drain and overflow only, not a faucet. Thank you for shopping with us. "hi. the current size of the hole were my old sink was in is L17 1/4 x W14 1/2 (hole size) would this sink fit?? thank you!!" Thank you for contacting us nikolaus1989. This is a white ceramic vessel sink and should rest on top of a counter. The hole size we recommend for the drain is approximately 5 inches. Please let us know if you have any further questions. "Is the back of this sink finished?" the back of the sink is not finished. "Is it true that this sink can be wall-mounted?" The sink is designed for above-counter installation.